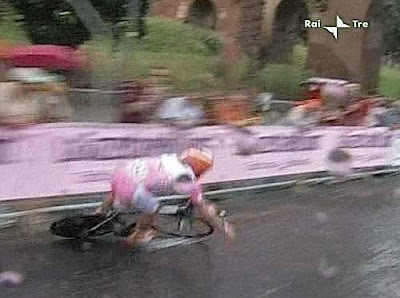 With less than 1 km to the finish in Rome, Menchov crashes on the wet cobbles and miraculously gets up and finishes with enough time to retain his lead over of Di Luca. 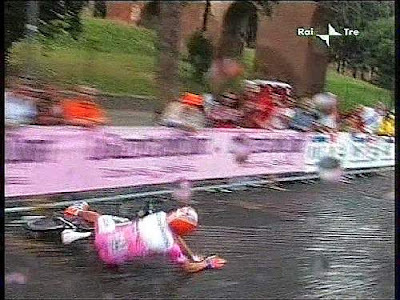 After the Giro we'll get back to "regular programming": everything from A to Z about Italian cycling. Stories, including cycling trip stories, for the Italian Cycling Journal welcome; contact veronaman@gmail.com. 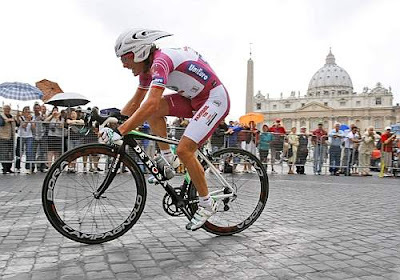 ROME, 31 May 2009 – Denise Menchov has won the Centenary Giro d’Italia (92nd race): the 31-year old from Rabobank is the third Russian in history to win the Giro, after Berzin (1994) and Tonkov (1996). 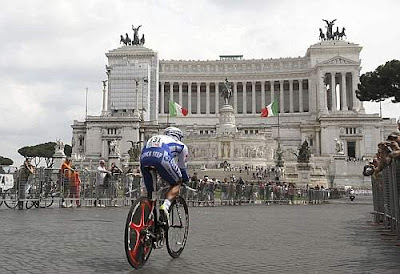 But this last stage of the Giro, a spectacular 14.4 kilometre individual time trial in the historic city centre of Rome (racing in the rain in the last part of the route), with a surprise win by the Lithuanian from Cervelo, Ignatas Konovalovas, was open right up to the end. Danilo Di Luca, who started off with 20 seconds to recover, was gaining 5 seconds after 3.3 kilometres. But in the second lap, (after 7.7 km), Menchov proved the forecasters right: +15 on Di Luca and the race and the question seemed closed. The last bit of excitement came at slightly less than one kilometre from the finish, when Menchov fell on a straight stretch of cobblestones. But he managed to get right back in the race, with a spare bike, and finish the trial in 19:06, 21 seconds better than Danilo Di Luca. RANKINGS — Konovalovas, one of the last riders to ride on the dry roads, finished the trial in 18:42, just 1 second better than the British racer Bradley Wiggins (Garmin) and 7 seconds ahead of the Norwegian Boasson Hagen (Columbia). The first Italian was Marzio Bruseghin, 5th with 18:58. The general ranking was as follows: Menchov won the Giro (this is the 27th time a non-Italian has won) with a margin of 41 seconds on Danilo Di Luca (LPR-Farnese). Franco Pellizotti (Liquigas-Doimo) is also on the podium, third at +1:59. Fourth is Carlos Sastre (Spa, Cervelo) at +3:46; fifth is Ivan Basso (Liquigas-Doimo) at +3:59. Sixth is Levi Leipheimer (USA, Astana) at +5:28. 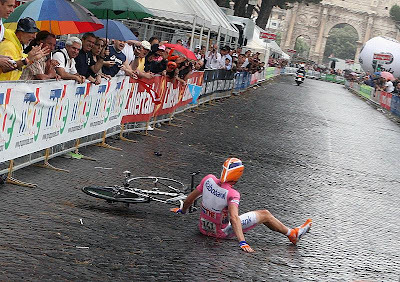 HOLLAND — Today the Giro organisers officially announced that the 2010 Giro will start from Amsterdam, on 8 May. This will be the ninth time the race has started outside of Italy, following the starts in San Marino (1965) Montecarlo (1966), Verviers (Belgium, 1973), Vatican City (1974), Athens (Greece, 1996), Nice (France, 1998) Groningen (Holland, 2002), and Seraing (Belgium, 2006). Holland is the site for the start of Spain’s Vuelta 2009 (from Assen) and the Tour de France 2010 (from Rotterdam). The second and third stage of the Giro 2010 will also take place in Holland: involving the towns of Utrecht and Middelburg. 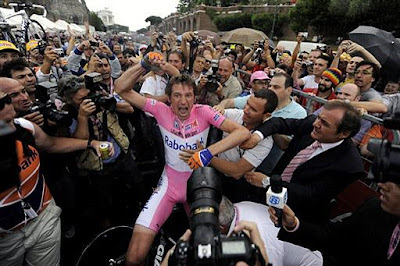 Rome, 31 May, 2009: An exciting finish to the 100th anniversary of the Giro d'Italia. Menchov, leading Di Luca by 20 seconds and who initially was 5 seconds behind Di Luca on the TT course, was going for the stage win when he crashed nearing the finish line. 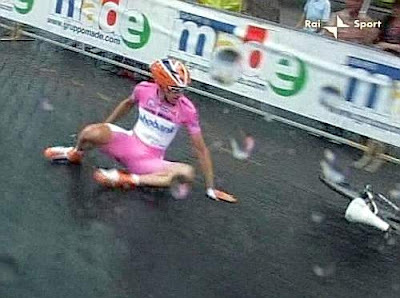 The Giro went into shock. 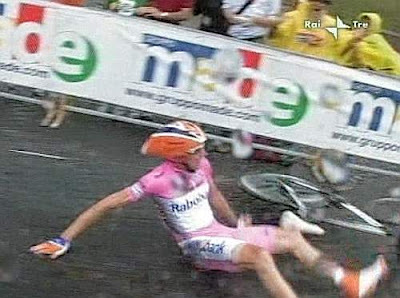 Rabobank's quick thinking mechanic jumped out of the team car and immediately supplied Menchov, who was trying to mount the crashed bike, with the spare bike. 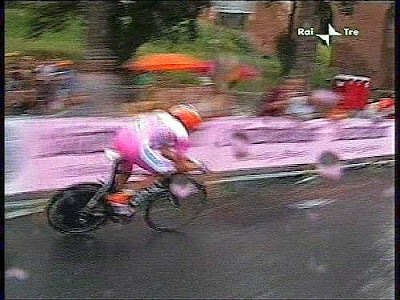 The Giro victory was saved. ROME, 30 May 2009 - Twenty three turns in 14.4 Km, speeds in excess of 50 Km/hour, and with rain in the forecast it should be an exciting finish. Mario Cipollini said, "If the weather forecast for rain beginning at 1630 is correct then the situation will become more complicated for the leaders of the general classification. With wet cobblestones it would be easy to fall. 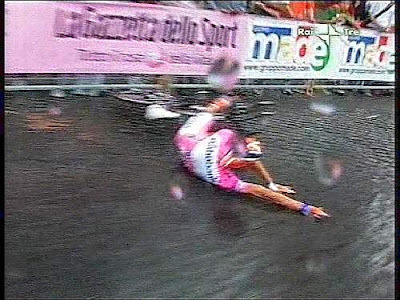 It wouldn't be a fitting end to Giro to be decided based upon a fall. The choice of wheels to use will be important, more important will be flexibility than aerodynamics, in my opinion a dish rear wheel will not serve any purpose." Favorites for today: Leipheimer, Armstrong, Rogers, Wiggins, Boasson Hagen and Menchox. ANAGNI (Frosinone), 30 May 2009 – The sign of surrender is at the peak of an intermediate sprint in Frosinone. Danilo Di Luca – who has 18 seconds to make up on Denis Menchov in the ranking - let himself be led by Alessandro Petacchi and, as always, the Russian was breathing down his neck. 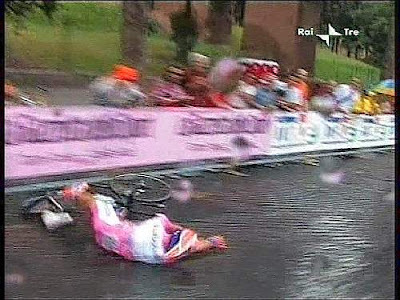 However, then the fixed image of the Centenary Giro changed. 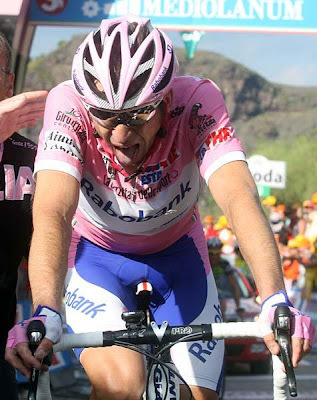 The pink jersey moved to the left and climbed at full speed, forcing Petacchi to pass first. The result: a time bonus of 4 seconds to Menchov and 2 seconds to Di Luca. MENCHOV’S SPRINT — "I never expected to do such an important sprint in an intermediate sprint,” admitted the leader of Rabobank, on his ninth day in the pink jersey. “Danilo is so close that I can’t yet say I’ve won. There’s still the time trial; I have to remain focused like I have over almost three weeks." LPR-Farnese’s version of the episode reads like an admission of guilt, "We didn’t think that the road was uphill," said Fabio Bordonali. "Menchov got ahead of me. My view was blocked by some houses; there were a lot of curves and I lost my bearings," Di Luca added. Di Luca and his team’s Giro d’Italia, however, remains more than positive. "I won two stages, one in the pink jersey. I’m wearing the cyclamen jersey and I did more than many predicted. Usually getting second place bothers me, but in this Giro there were some great champions." 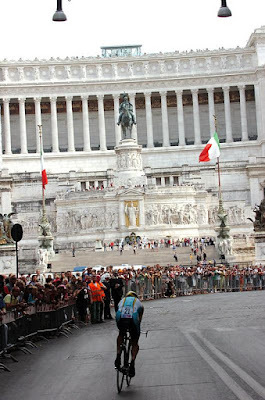 METRE AFTER METRE — The last act remains: the time trial in Rome (14.4 km) in the extraordinary set provided by via dei Fori Imperiali, piazza Venezia, via della Conciliazione, and the Coliseum. "Danilo has to fight up to the last metre,” highlights Stefano Garzelli.”It’s a time trial with a lot of curves, and Danilo knows how to race well in these situations." The Russian who is strong at time trials, climbs and intermediate sprints knows this. It will be very difficult to surprise him. 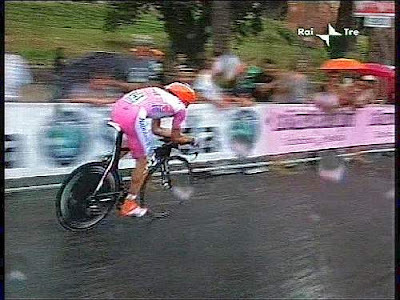 Even though the 14.4 Km time trial remains to be completed this year's Giro has been officially proclaimed today to have been the fastest in history. The average speed will surpass 40 Km/hour exceeding the previous fastest times of winners Saronni in 1983 with 38,937 Km/h and Simoni in 2003 with 38,917 Km/h. 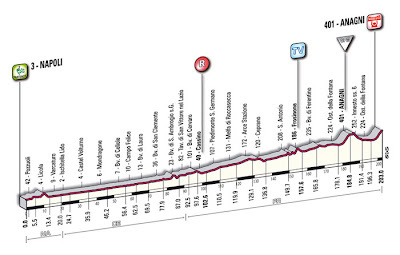 Rome is a truly extraordinary setting for the final stage of the centenary Giro d’Italia. With its incredible history and universal heritage that is recognised and admired the world over, the Eternal City is a fitting backdrop for the end of this year’s 'corsa rosa’. A parade of priceless monuments with unique significance that will undoubtedly spur on all competitors to produce their very best. 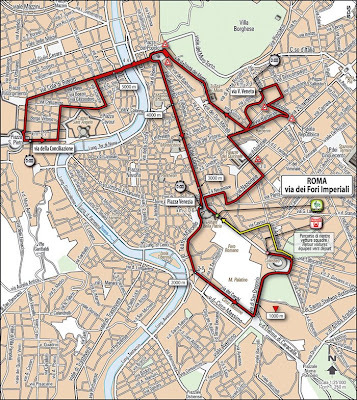 The race finishes with a 14.4 km individual time trial that starts and ends in Via dei Fori Imperiali, in Piazza del Colosseo. Unlike the ferocious and aggressive gladiators of Roman times, these “gladiators” on two wheels will offer a spectacle high on technical skill and speed, with the linear route – suitable for the sprinters – taking in roads and sites that reflect all the prestige of the Italian capital. The course remains largely flat right the way through. A simple list of some of the locations along the route is enough to bring a flood of historical and artistic references to mind: Via dei Fori Imperiali, Piazza Venezia, Via del Quirinale, Via 20 Settembre, Porta Pia, Corso Italia, Via Vittorio Veneto, Piazza Barberini, Via Due Macelli, Piazza di Spagna, Via del Babuino, Piazza del Popolo, Ponte Regina Margherita, Via della Conciliazione, Castel Sant’Angelo, Lungotevere dei Mellini, Piazza Venezia again, Piazza del Campidoglio, Via del Teatro Marcello, Piazza Bocca della Verità, Via del Circo Massimo, Viale Aventino, Via di San Gregorio, Piazza del Colosseo and the finish back in Via dei Fori Imperiali. It is a time trial through ancient and modern history, not just that of Italy but of the entire world: history that cannot be found elsewhere. 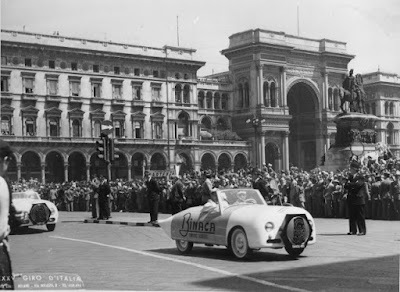 Rome hosted a stage at the first Giro with the Naples-Rome stage won by Luigi Ganna. In 1910 it was won by Pavesi, in ’11 it was won by Corlaita (the final stage of the Giro won by Carlo Galetti), and in ’12 the stage was cancelled due to a route error. In 1913 victory went to Santhia, in ’14 and ’19 it was Girardengo, in ’20 Belloni (also overall winner), in ’21 Annoni, in ’22 Linari, in ’23 Girardengo, in ’24 Gay, in ’25 and ’26 Girardengo, in ‘27 Binda, in ’28 Piemontesi, in ’29 Binda, in ’30 Guerra, in ’31 Meini, in ’32 Guerra, in ’33 Cipriani, in ’34 and ’35 Guerra (Giro winner in 1934), in ’36 Olmo, ’37 Di Paco, ’38 Cinelli, ’39 Bizzi, ’40 Adolfo Leoni, ’46 Bertocchi, ’47 and ’50 (end of the Giro won by Koblet) Oreste Conte, ’48 Casola, ’49 Ricci, ’51 Menon, ’52 Belgian Keteleer, ’53 Minardi, ’54 Albani, ’55 and ’58 Nencini, ’59 Rik Van Looy, ’61 Giusti, ’66 the late lamented Raffaele Marcoli, and ’68 Dalla Bona. In 1974 the Giro begun in the Vatican with the blessing of Giovan Battista Montini, Pope Paul VI, and was won in Formia by the unheralded Wilfried Reybrouck ahead of De Vlaeminck and Sercu. Swiss Urs Freuler did the double in 1982 and 1989. 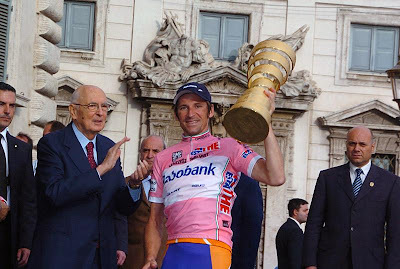 In the Jubilee year of 2000 the Giro once again begun in Rome, and was granted a special audience by Pope John Paul II. 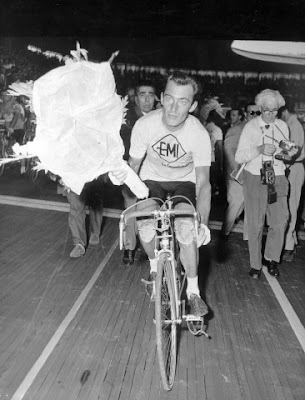 The powerful Jan Hruska took the spoils in the preliminary time trial. 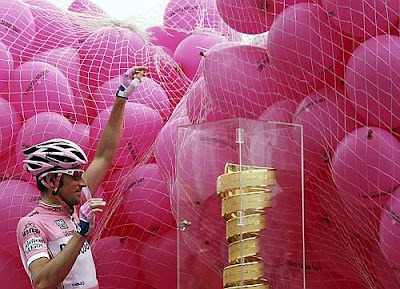 One thing is certain: whoever wins the 2009 Giro d’Italia won’t be able to celebrate their victory in better surroundings. 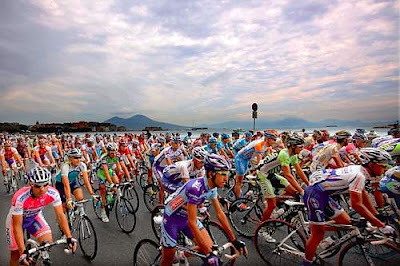 A magnificent conclusion to the first hundred years of the race, the sturdy foundations on which to construct the next hundred and more years of the emotion-packed and thrilling event that is, and will be, the Giro d’Italia. 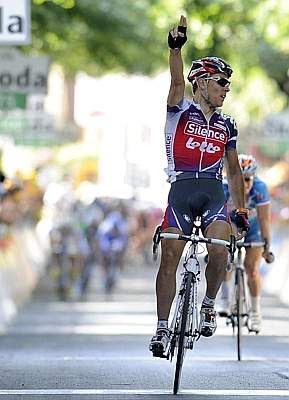 ANAGNI (Frosinone), 30 May 2009 - Philippe Gilbert has won the 20th stage of the Giro d’Italia, 203 kilometres, Naples to Anagni, with a strong attack one and a half kilometres from the finish line. For the Belgian racer of the Silence-Lotto team, 26-years old, this is the first victory this season, and the 20th in his career: he clearly beat the French rider Thomas Voeckler (by 2 seconds) who had attempted to keep up with him. Third, at + 7, was Stefano Garzelli. GENERAL RANKING — Denis Menchov (Rus, Rabobank) gained an additional two seconds on Danilo Di Luca as a result of his sprint finish in Frosinone and now has a margin of 20 seconds with only the 14.4 kilometres of the time trial in Rome to go. Third is Pellizotti at +1:43; fourth is Sastre at +2:44; fifth is Basso at +3:37. 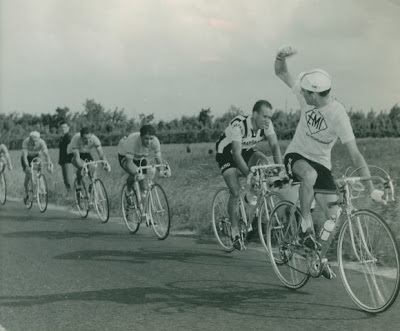 THE DETAILS — The race is now naturally centred around the battle between Menchov and Di Luca for the pink jersey, and thus, there was no room for the breakaway. The peloton caught up to Forster (Milram), Swift (Katusha), Cardenas (Barloworld), Gomez Gomez (Fuji), Lastras (Caisse d'Epargne), Lund (Saxo Bank), De Bonis (Diquigiovanni) and Bonnafond (AG2R) shortly before the sprint finish in Frosinone, where Di Luca tried to gain a 6-second time bonus. But Menchov was ahead of him and only Petacchi managed to cross before the Russian who, in any event, gained 4 seconds, while Di Luca took third place and the related 2 seconds. The Russian racer for Rabobank now has 20 seconds on Di Luca. And all the other attempts, even in the final lap in Anagni, were nothing but a prelude to an exciting finish. 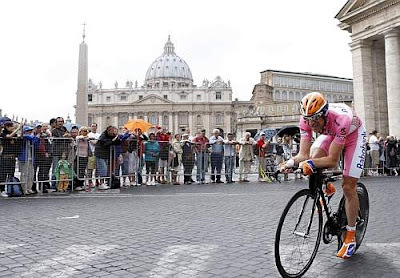 TOMORROW — The spectacular conclusion of the 100th anniversary of the Giro d’Italia – 92nd race – with a 14.4 km individual time trial in the heart of Rome where the awards will be given by the President of Italy Giorgio Napolitano. Starting from Fori Imperiali the pink jersey will bike to the Quirinale square with all the other racers for a moving ceremony unique in the history of the Giro d’Italia. Final roll-call for the sprinters in the penultimate stage of the Giro d’Italia, from Naples to Anagni, in the province of Frosinone. Naples, with all that this extraordinary city has represented and still represents in terms of the history, culture, monuments, traditions, landscapes, environment and lifestyle of its extrovert population, unique and international, welcomes back the Giro d’Italia having been a stage finish in the first ‘corsa rosa’. On that occasion it was the 3rd stage, a 242-km route beginning in Chieti. A 'short' stage with respect to the customs of the time, with victory going to Giovanni Rossignoli. 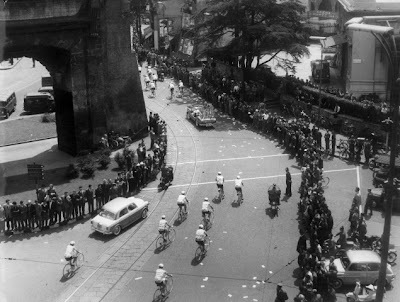 In subsequent years, stages concluding in Naples were won by: Albini, Belloni, Aymo, Girardengo, Zanaga, Belloni again, Girardengo, Binda, Piemontesi, Belloni for a third time in ’29, Di Paco, Mara, Guerra, Loncke, Guerra, Di Paco again, Olmo, and Guerra for a third time, just like Di Paco, in 1938. 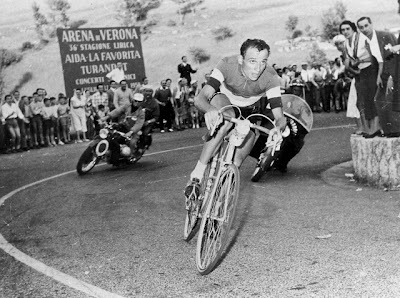 In 1940 it was the turn of Servadei, and he was emulated by Ricci in ’45, Coppi in ’47, Logli in ’48, Biagioni in ’49, Brasola in ’50. Casola in ’51, Van Steenbergen in ’52, Milano in ’53, Van Steenbergen again in ’54, Zucconelli in ’55, Vito Favero in ’57, and Poblet in ’59. 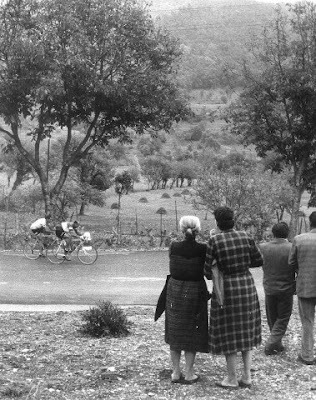 In 1963 the Giro begun in Naples with the eve and the first part of the race dominated by controversy surrounding Bruno Mealli and Marino Fontana, with both men wearing the champion of Italy vest. 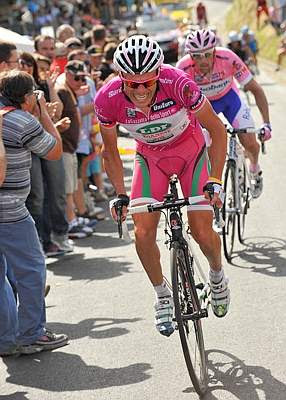 The power struggle between the federation as it was and the professional movement was extremely intense, as events at the Giro proved. Basso won here in ’66, Guido Reybrouck did likewise in the final stage of the ’68 Giro, the first of Merckx’ five titles, Basso again in ’69, and another great sprinter, Cipollini, in 1995: this is a summary of the Giro’s relationship with Naples – which boasts a long history of classic races held at the Arenaccia, such as the Giro di Campania and the Roma-Napoli-Roma – where the sport is enthusiastically supported by a small, but highly knowledgeable group of fans that adore cycling and its history. 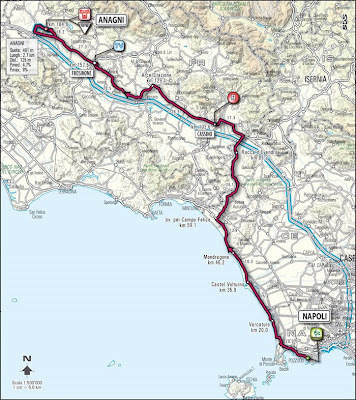 The route is practically flat, leaving from Pozzuoli and heading into the province of Caserta via Castel Volturno, Mondragone – known for its delicious mozzarella - and Campo Felice, and then into the region of Lazio and the province of Frosinone. Cassino, with its history and imposing Benedictine abbey that dominates from above, was founded by St. Benedict of Nursia in 529 and rebuilt after being destroyed during the Second World War. 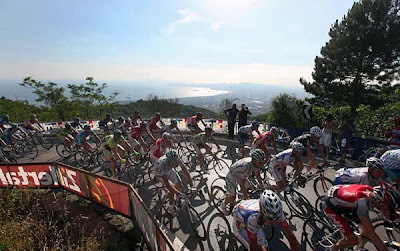 Ceprano and then Frosinone, administrative capital of the Ciociaria region, are the other main towns that mark the route towards Anagni, which hosts the 'corsa rosa’ for the first time this year. There is a gentle climb from the bottom of the valley to the built-up area where the finishing line is located, although before crossing this, competitors will first have to complete the final circuit. Anagni is situated on a spur of the Ernici hills that loom over the Sacco valley and boasts an ancient noble tradition that is also evidenced by the number, nature and architectural value of the historic and religious buildings found here. These include the Cathedral and the adjoining museum with its precious hangings and priceless sacred objects, the palace of Pope Boniface VIII, Casa Barnekow, the best known of the numerous medieval and renaissance residences in Anagni, and other pieces of heritage that conserve the medieval imprint of the town in the urban fabric. Anagni is also known as the “city of the Popes”, having been the birthplace of numerous Popes and for being a kind of "papal capital". Its fame, also literary in nature, is also due to an episode known as the "outrage of Anagni". It was 1303 and the Church was embroiled in a struggle with the sovereigns of various nations over its temporal power when emissaries of the King of France, Philip IV, also known as Philip the Fair, led by Sciarra Colonna, arrived in Anagni and threatened to take Pope Boniface VIII, who lived there, as hostage. According to legend, the Pope was slapped by the emissaries, hence the other epithet by which the episode is known by, “the slap of Anagni”.The excommunication of Pope Alexander III against Barbarossa began in the Cathedral of Anagni. The wide array of culinary delicacies and wines in the Anagni area is both rich and of the utmost quality. 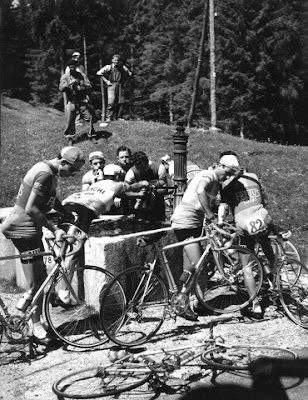 1955 - A phase of the memorable escape of Coppi and Magni on the Trento-San Pellegrino Terme stage. 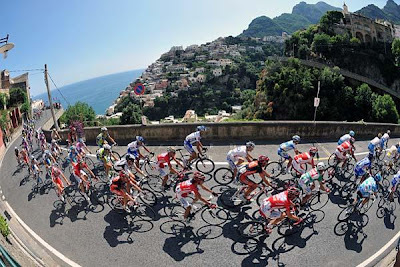 Watching the peloton pass through beautiful Sorrento today reminded me of the wonderful Limoncello from there. Limoncello is serious business, there is even the equivalent of wine "D.O.C." for lemons, "I.G.P" (in English, Protected Geographical Indication). Limoncello is the generic name for an Italian citrus-based lemon liqueur that is served well chilled in the summer months. 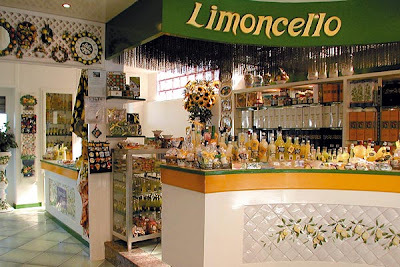 Limoncello is now considered the national drink of Italy and can be found in stores and restaurants all over Italy. Limoncello is an absolutely natural product acquired by the infusion of lemon skins in pure alcohol. It has become Italy's second most popular drink after Campari. Refreshing and light, it is wonderful as a palate cleanser or as an after dinner drinks. It is also an incomparable digestive, and with tonic water, it is a sweet, tasty refreshment. It's also great mixed with champagne or juice as a cocktail. It even does well simply drizzled on ice cream, fruit salads, or fresh strawberries. Keep your bottles of limoncello in the freezer until ready to serve. The ingredients are simple and few, and making a batch doesn't require much work, but you'll need some time. In most recipes, limoncello must steep for (80) eighty days. History: It has long been a staple in the lemon-producing region along the Italian Amalfi Coast in Capri and Sorrento. The Amalfi Coast is known for its citrus groves and narrow winding roads. Authentic limoncello is made from Sorrento lemons, which come from the Amalfi Coast. Families in Italy have passed down recipes for this for generations, as every Italian family has their own limoncello recipe. * Choose thick-skinned lemons because they are easier to zest. Wash the lemons with a vegetable brush and hot water to remove any residue of pesticides or wax; pat the lemons dry. Step One: In a large glass jar (1-gallon jar), add one bottle of vodka; add the lemon zest as it is zested. Cover the jar and let sit at room temperature for at least (10) ten days and up to (40) days in a cool dark place. The longer it rests, the better the taste will be. (There is no need to stir - all you have to do is wait.) As the limoncello sits, the vodka slowly takes on the flavor and the rich yellow color of the lemon zest. Step Two: In a large saucepan, combine the sugar and water; cook until thickened, approximately 5 to 7 minutes. Let the syrup cool before adding it to the limoncello mixture. Add to the limoncello mixture from Step One. Add the additional bottle of vodka. Allow to rest for another 10 to 40 days. Start by washing your lemons in warm water to remove the wax from the outside, or use unwaxed, organic lemons. Next, zest the lemons carefully using a microplane or very small holed grater. Make a point not to go too deep and get any of the white pith of the rind in with the zest as it will make your finished product bitter. You're just after the oils and they are in the yellow part at the surface. Now add your lemon zest to your booze and let it sit unmolested by light or extreme heat for two weeks, giving it a shake twice day or so. At the end of the two weeks, strain the vodka through cheesecloth or a fine strainer. Press the zest firmly to extract the maximum flavor. Take your sugar and water and bring it up to a low boil. When the liquid has become clear, the sugar has dissolved into the water. Turn it off and let it cool. (This is commonly known as simple syrup.) When your syrup is cool, thoroughly mix in your lemon-vodka infusion and decant into your various containers. Now, just attach a funny note and give away to your fake friends making sure to mention that it took you the better part of two months to make. Variations: You can use citrus other than lemons with this recipe. Flavor will vary wildly depending on whether you choose to use grapefruits or tangerines. If you plan on sipping your limoncello yourself on a far-in-the-future hot summer day, you can add less simple syrup for a more tart and bracing flavor. Also, if you are not being pressed by the holiday deadline, you can let the zest or the finished product age longer to make it stronger and smoother. Wash the lemons in hot water and clean with vegetable wash (organic and nontoxic). Scrub vigorously and rince.. Note: Lemon peels are how you create the drink’s flavor and color, so it is important that the lemons are clean. I found the vegetable wash at Whole Foods for pretty cheap (less than $3). I've found that nearly every lemon sold in a store is coated in food wax. You need to remove this wax as much as possible before you peel the lemons. I looked everywhere for lemons without wax (Trader Joe's, Whole Foods, local markets) without success. Peel the lemons (retaining the peels for later) being sure not to peel any of the white part under the peel, otherwise known as pith. Note: Peeling is another key step. It is very easy to get the pith when peeling. You'll inevitably get some while you're peeling, but if you keep it at a minimum, you should be OK. The pith creates a bitter finish to the limoncello that you want to avoid. We used a super sharp, large-size vegetable peeler to get the peels off. Keep the peels in long strips to make it easier when you strain later. You can use a sharp knife if you're not afraid of losing a thumb. I've heard of others using a zester for this step, but I've found that to be prohibitively tedious, especially if you're doing a double batch. Put the lemon peels in a large glass container with the vodka and everclear. Note: Some people will use only Everclear and some only vodka. I've found that a mixture is the best recipe. You're not so over the top alcoholic by using the Everclear only, and the vodka alone can be too low in the alcohol content, resulting in a limoncello that freezes in the freezer— which is where it is ideally kept. The higher alcohol content of Everclear prevents it from being diluted to the point where it freezes. Swirl the lemon peel and alcohol mixture together daily in the jar. Store the lemon peel and alcohol mixture for as little as two weeks or up to four months. Note: The longer you leave the peels in contact with the alcohol, the more yellow and lemony your limoncello will be. After two weeks, you'll likely get a limoncello as good as anything you can buy in a store for $20 or so. A little longer will get you the type of limoncello that you can find only in Italy in small shops on the Amalfi Coast (and on Capri) or in the freezers of Italian grandmothers throughout the country. After you get to the point where you're ready to finish the limoncello, remove the bigger peels with a slotted spoon. Once you've removed the bigger peels, you need to strain the entire mixture through coffee filters to remove as many of the impurities as possible. You can do this by putting the filters into funnels and straining that way. Note: If you pre-wet the filters with water, they won't absorb as much of the liquor mixture, reducing waste. Meanwhile, you can be working on the sugar syrup. Mix the sugar and water. Bring to a boil, stirring occasionally. Let boil for at least seven minutes. Let syrup cool to room temperature, and then combine with lemon-alcohol mixture. At this point you can bottle using funnels. You should ideally let the limoncello "marry" together for a week in the bottle before consuming, but no one's going to fault you if you sneak a taste or two. If you think that you're going to be making limoncello, start holding onto bottles, especially interesting, decorative ones. Limoncello makes a great gift that's homemade. If you want to stretch your limoncello stash and still spread the love, get miniature decorative bottles with swivel tops from Cost Plus World Market and fill those as the gift. 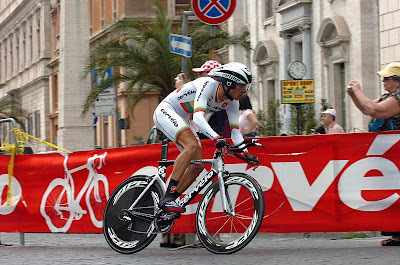 ERCOLANO (Naples), 29 May 2009 - Carlos Sastre has won the 19th stage of the Giro d’Italia, from Avellino to the last uphill finish of the race, on Mt. Vesuvius. The 34-year old Spanish racer for Cervelo, the kind of the Tour de France 2008, gained a lead with a decisive attack slightly less than 5 km from the finish line, when he left Ivan Baso behind, thus providing an encore of Monday’s victory on Monte Petrano, which was also an uphill finish. 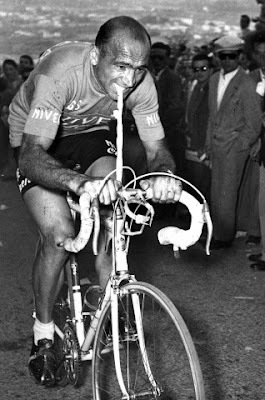 Sastre, counting his eighth victory in his 13 years as a pro, crossed the finish line with 21 seconds on Franco Pellizotti. Third, at +30, was Danilo Di Luca, right ahead of Denis Menchov. The Italian thus gained 8 seconds in time bonus for third place. Fifth was Basso at +33. Sixth, at +53 was Leipheimer. Then came all the rest. GENERAL RANKING — Denis Menchov, who personally fought off all the attacks without showing any signs of fading, still has an 18 second lead on Danilo Di Luca. Third is Pellizotti at +1:39. 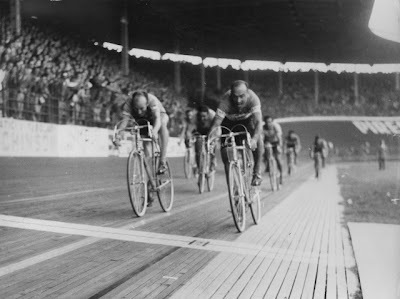 Fourth is Sastre, who sped ahead of Ivan Basso. THE DETAILS — 171 racers took off, and after 16 kilometres, Facci and Krivtsov broke away. The first hour flew by at an average speed of 49.8 km/h. The speed naturally slowed when the racers had to face the beautiful but torturous roads of the Almafi coast. Menchov had a puncture, Armstrong fell, but the Russian and the American started up again with no problems. 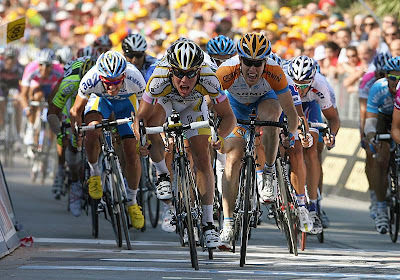 There were no great breakaways: the group of sprinters was caught right at the foot of Mt. Vesuvius. Agnoli, a team-mate of Basso and Pellizotti, attempted the first attack. Behind him was Tiralongo, of Lampre-NGC. Shortly after the -9 km banner, here came the scouts Basso and Ochoa with Garzelli. Just before eight kilometres from the finish line Di Luca made his first attack. Menchov immediately fought back. At minus 7.5 km, Basso moved forward to remain alone in the lead: Sastre joined him and the two had 12 seconds on Gilberto Simoni and about twenty seconds on the group of the top riders. At minus 6 km Garzelli, from behind, spurted forward in pursuit. At minus 5 km Basso and Sastre passed by with 35 seconds on Simoni and Arroyo and about 50 seconds on the group of top riders, then Sastre remained alone in the lead. 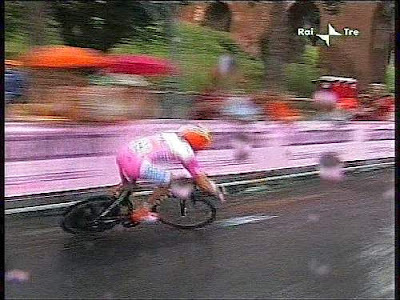 Di Luca attempted another burst of speed at minus 4.5 from the finish line, once he had passed Simoni and Arroyo. Menchov and Pellizotti were in pursuit. 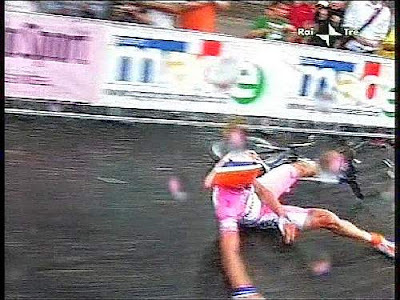 At that point there were two races: one for the final victory and one for the pink jersey. 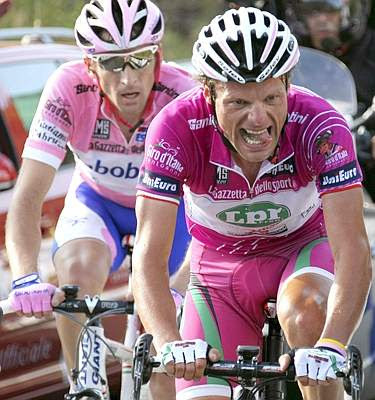 Pellizotti tried several attacks: at minus 2 km was his most decisive, and his team-mate Basso was waiting for him ahead. 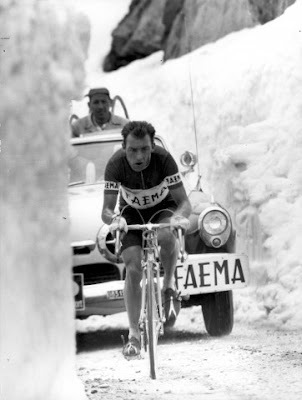 Behind them, Di Luca made another attempt to leave Menchov behind, but in vain. 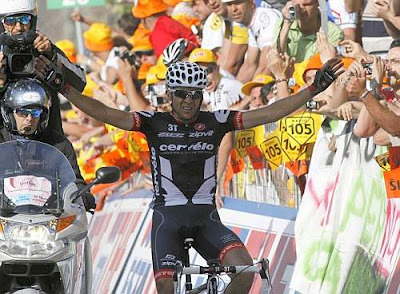 And Carlos Sastre went on to win, with Basso being pulled back by Pellizotti, Di Luca and Menchov. 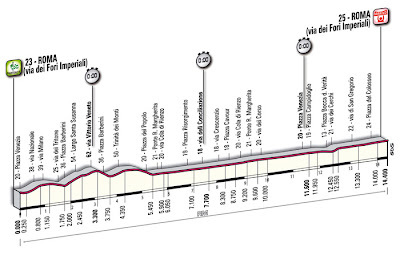 TOMORROW — The 100th anniversary of the Giro d’Italia – 92nd race – continues with the 20th, penultimate stage: from Naples (the Giro returns to the capital of the region of Campania after 13 years: in 1996 Mario Cipollini sped to a win in via Caracciolo) to Anagni, 203 kilometres. There are no great ups and downs, but it has a steady, slight uphill finish. Poll: Who Will Win On Monte Petrano? 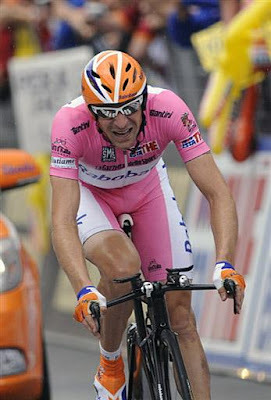 Stage 15, Part II: Basso "Unsatisfactory Result"
Armstrong: Who Says I'm Boycotting the Press? Di Luca: “It’s not over. Where is Liquigas?" 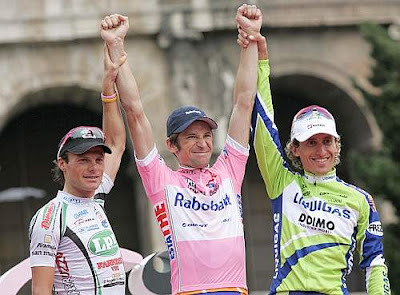 Poll: Who Will Wear the Pink Jersey in Rome? Danilo Di Luca's De Rosa King "RS"
Happy 100th Birthday Giro d'Italia! Who Will Wear the Pink Jersey After Stage 4? Hot News: NAHBS 2010 Announcement! !